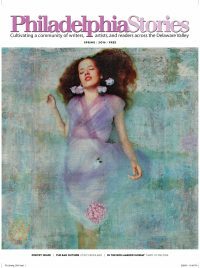 Miller’s new short story “The Salted Leg” appeared in the Winter 2015 issue of The Missouri Review and was nominated for a Pushcart Prize. He’s currently working on a novel, which he hopes to complete in September during his second residency at the Byrdcliffe Artists Colony in Woodstock, NY. “My dad was a drinker and when I was five years old I was sitting next to him at the bar drinking orange pop, listening to all the hunters, fisherman and factory workers tell their stories. Storytelling was a big part of life there and these guys had it. They had timing, they knew what to tell and what not to tell. They had irony and description. Miller took that advice, going through the fiction section in the local library book by book. In the resulting story, Tom Grant owns a decrepit and mostly forgotten museum displaying, in rows of Bell jars, earth samples from all over the Americas that he inherited from his father. He also inherited a set of rigid ‘Christian’ values and terrible memories of abuse. When an elderly couple visits the museum, on a mission to connect with their dead son through a particular earth sample, Tom’s carefully constructed world begins to collapse. Tom at first refuses them, but their quest eventually forces him to confront his own shortcomings and longings. “In His Condition” explores the emotional and psychological ravages of alcoholism as the narrator, on a seven-week long bender, ponders his uncle’s addiction and that man’s recovery through his devotion to collecting butterflies. He is home, in the house where he grew up, searching for his own “saving thing” as his mother, downstairs, calls doctors and “drunk farms”, hoping to find a placement for him. Several of Miller’s stories, set so carefully in place and time, edge toward the magical, while others, including Night Train, Killing Houdini and Certain Miracles weave lyricism into traditional realism and historical events. Afficionados of short fiction may detect whiffs of Russell Banks, Bonnie Jo Campbell, Denis Johnson and Daniel Woodrell in the work of Miller, but Miller offers a bit more lyricism in his prose, along with a tad more tenderness in his resolutions. With his first collection published and a novel in its final stages of creation, Miller has this advice to young ambitious writers: “Don’t wait for the world to tell you when you’re a writer, just write. Start writing, send your stuff out. Form relationships with magazines and with other writers and read all the time. You can’t be a writer if you don’t read. Find a book you like and try to figure out how it works. Go through the book, write all over it, make notes, and underline sentences you like.